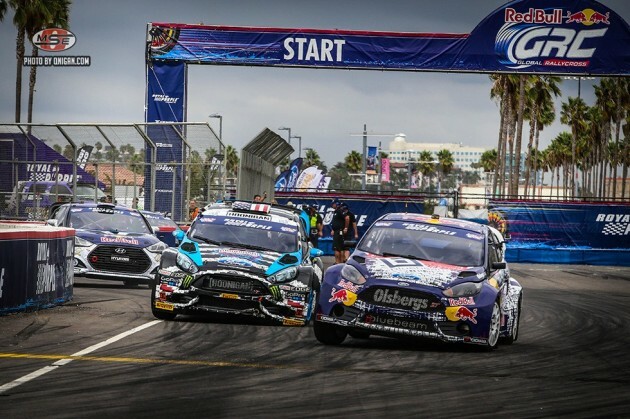 For the fourth year in a row, Ford reigns supreme in the Red Bull Global Rallycross Championship (GRC), winning the Manufacturers’ Championship after a double podium finish in Round 7 in Los Angeles on Saturday. Then, just to show everyone they weren’t messing around, the same two drivers went out and did it again on Sunday. Ford’s fourth title in as many years was clinched with a second-place finish by Olsbergs MSE’s Joni Wiman and a third-place finish by HRD’s Ken Block during Saturday’s Round 7 race, which was won by Scott Speed. The next day, Block and Wiman switched positions, placing second and third behind Rhys Millen in Round 8 and bringing both drivers that much closer to the coveted driver championship. How good has the Fiesta ST been in GRC this year? 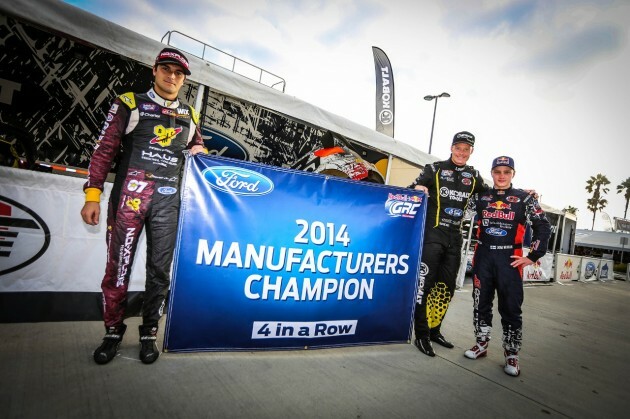 Ford’s already earned the 2014 Manufacturers’ Championship despite there still being two rounds of competition left. The Round 4 race in Washington, D.C., wherein Ford scored the only perfect points race of the season, is a big reason that the Ford Racing team has already made off with the title. What’s the spread? Through eight races, Ford Racing has piled up 748 points. Its closest competitor is Volkswagen with 441, followed by Subaru with 364, Hyundai with 199, and GM with 5. Through eight races, Ford Racing has won twice and secured at least one podium place in every contest. To boot, Block sits atop the leaderboard for the driver championship with Wiman 18 points behind him in second place. The penultimate Red Bull Global Rallycross Championship race takes place on September 27 from Seattle.